Hank Norwood began working for Family Pharmacy at Allegro Plaza on April 15, 2016. He received his Bachelor of Science in Pharmacy degree from The University of Mississippi. Hank enjoys running, gardening and spending time with family. He also takes part in local theater productions. He says, “The best part of my job is being able to serve people and build relationships with them. 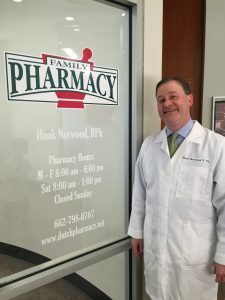 Our Pharmacy offers a wide range of health care services from immunizations to essential oils.” Hank is married to the former Christie Green of Columbus and they have one son, Parker. The Norwoods are members of Fairview Baptist Church, where Hank serves as a deacon and Sunday school teacher.